Girlia's Cards: Cardz TV Gallery: Red, White and Blue Blog Hop!! 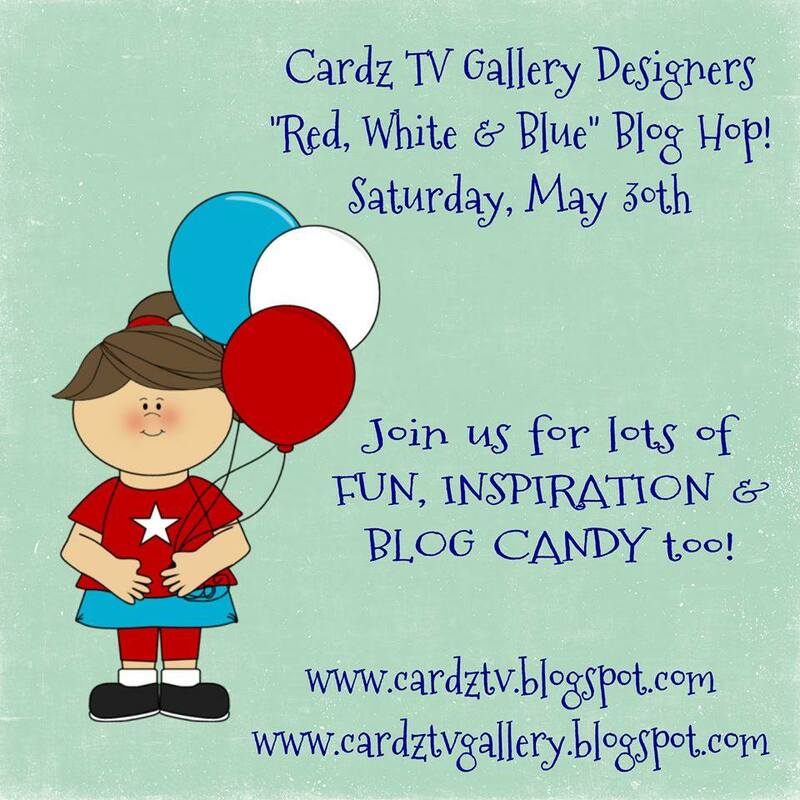 Cardz TV Gallery: Red, White and Blue Blog Hop!! Thank you for joining me or shall I say us this week for our Red, White and Blue Blog Hop!! These colors were a real challenge for me...yeah I am so used to seeing our flag and many patriotic symbols with these colors, but I wanted something fun and cute if possible and hopefully I have acheived both with this card. The last picture is where you would write your note. Awesome! card. I really like the bright red, white and blue colors. OMG Your card is Awesome. You really did a great super great creative job....Love the faces on your fireworks and all of the papers you chose...and that stamp set is awesome. What a Funtabulous 4 of July card...LOVE IT!! YOU ROCK!! What a neat style of card. Great for Independence Day! 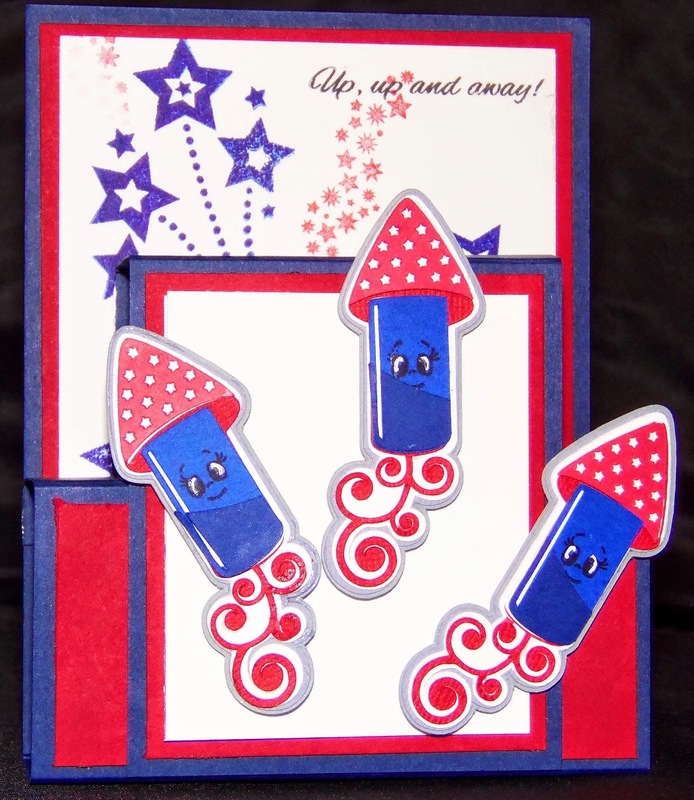 Gloria love your card so inspired those firecrakers are super sweet. Fire crackin' fun. Like the colors, papers & dimension. This is so adorable!!!! Love it!! Gloria, you achieved you goal. Great card. I love it. Thanks for sharing. Love those faces on the firecrackers! Too cute. 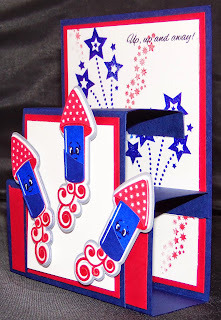 Love those firecrackers and the way your card goes together! Haven't seen this style card before so "kudos" to you! What a fabulous card!! Love it!! Have a great day. Super DUPER cute!! Love the fun sentiment and PK faces!! What a fun card. I like how you stamped the stars in both red and blue. Very creative. Now I'll have to search for the firecracker from MKC. That's for the inspiration. Awesome card. I love those firecrackers. Great card! I love the firecrackers and stars! Oh wow!! What a fabulous card!!! Love it!! What a fun and delightful card! I love the crisp lines and the bold colors. The Fourth will be here before we know it and you are ready! What a fun card! Thank you. Love love love this card and it's shape, YOU ROCKED this card!!! Now those are some Cute little Firecrackers. It's so Fun! I wish I knew how to make one. Great Job! Love love love your card!!!!! The rockets are so cute. Cute! I love the little faces on the firecrackers. Wow! Such a fun card. What a cute card! Thanks for the idea. Thanks a great card with it's unique folded shape. I've never seen one like it. This is a FUN card! I love this unique card! I love the folds and images you used. You did a great job on this project!! Have a blessed weekend! You nailed "Fun and Cute"
This is a great card. 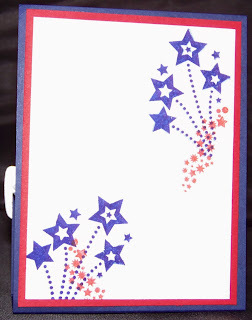 Gloria - a super Red white and blue card - just right for a USA celebration! Thanks for sharing! What a fun card Gloria. Super cute. So cute and festive and I love your fancy fold! Oh my, such a cute card. I love the fireworks! Thanks for sharing!! Oh this is so cute--- I love this card design super fun! What a fun and festive card! I love the style of card you used, what is it called? Those little firecrackers are adorable! So adorable! Such a clean card design! this is such a cute card, I love the 3d effect. Wow, that is so gorgeous! I love your pop out card! those silly little firecrackers are adorable!! Love your card. Your fire crackers are so cute. Thanks for sharing. Oh my goodness... I just love those adorable faces on your rockets!!!!! Your card is oh so too cute for words!!! Action Wobble: Fly me to Moon! Pretty Paper Pretty Ribbon Guest Spot! Cardz TV Gallery: Happy Mother's Day!!!! Pretty Paper Pretty Ribbon: Go Green Challenge!